Does your computer suffer from Internet Security virus previously described by us? Well, you are not the only user who now encounters this rogue anti-spyware application. Much has been already written by us regarding this bogus anti-virus tool and the way it acts on the infected computer. As you know, this program does not take your preferences into consideration, thus installing itself to your PC without your consent, knowledge or approval for such actions. In addition, it would amend the system registry parameters in order to get launched automatically with every Windows startup. This means that users would see the window of Internet Security malware each time they turn their computers on. Then the rogue initiates the fictitious scan of the computer with advanced report about lots of threats, infections and other vulnerabilities supposedly detected on it. The program prompts users into purchasing its full or licensed version, which is not able to detect or remove real threats, just as the trial one. 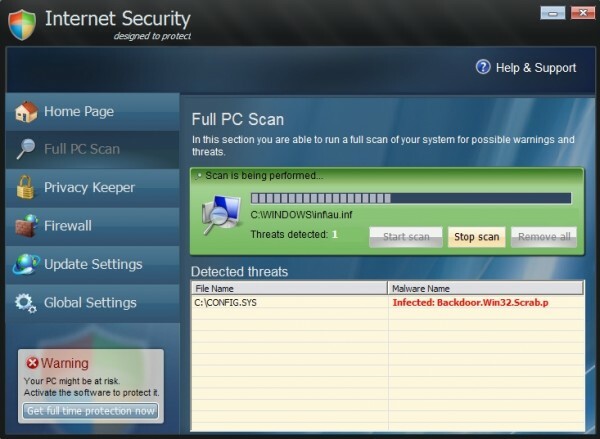 Isecurity.exe is the core process of Internet Security rogue anti-virus. It is also known as Internet Security 2012, but both of these applications have the same process name, that is isecurity.exe. The issue of successful termination of this process is what determines successful removal of the above-mentioned rogue application. The malware we told you about blocks all your attempts to delete it. For example, when you try to launch Task Manager the hoax will tell you that its executable is infected with W32.Blaster.Worm virus. The same report would come up when you attempt to launch available anti-virus software installed on your computer, or to download it over the Internet. Below please find the necessary guidelines that will help you to bypass the blockage on the part of Internet Security virus and to download and execute anti-virus software able to get rid of the rogue.